Prime Minister Binyamin Netanyahu met with the European Union's new foreign affairs chief Federica Mogherini in Jerusalem on Friday, where he made a partial push for Jewish religious rights that fell short of prayer at the Temple Mount, the holiest site in Judaism. "The Temple Mount is the site of the Jewish temple; it's the site of the Al-Aqsa Mosque; it's close to the sites of, holy sites of Christianity. And we are committed to maintaining the status quo for religious access to all faiths," said Netanyahu. "We stand by the rights of Jews to go to the Mount. They pray in the Western Wall, but they do have a right to go there (to the Mount - ed.). We stand by the right of Muslims to go to the Mount and pray in the Al-Aqsa Mosque. They've been doing that for many, many decades and will continue to do that," the prime minister said, denying Jewish prayer at the holiest site in Judaism. 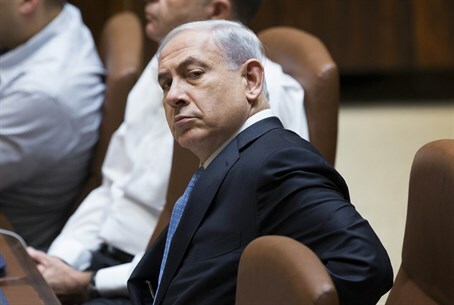 Netanyahu added "we stand behind the status quo arrangements that have been there for many years. We will not allow them to be changed either by action or by legislation." The statement evidently refers to a bill seeking to allow Jews to pray at the site, where they have been banned from doing so by the Jordanian Waqf (Islamic trust) that still enjoys de facto control. Just on Thursday, Netanyahu called Jordanian King Abdullah II and promised him the discriminatory status quo would be maintained at the site, after reportedly holding a secret meeting with him on Saturday in Amman, where he said he was considering a total ban on Jewish entry to the Temple Mount. "Islamist parties...including Abu Mazen (Mahmoud Abbas - ed. ), the Chairman of the Palestinian Authority, have joined in a campaign of inflammation, calling for any action, including violent action, to stop Jews from exercising their right to merely enter the Mount," Netanyahu continued. Indeed, Abbas's Fatah faction called for more car terror attacks after the attack this Wednesday, and Abbas has stirred up terror calling to stop Jews "defiling" the Temple Mount by "all means necessary," in an uncanny resemblance to former PA Chairman Yasser Arafat's call for the 2000 Second Intifada. "Jerusalem is not a settlement"
After imposing a covert freeze on Jewish construction in eastern Jerusalem, Judea and Samaria for many months amid a housing crisis, Netanyahu has in recent weeks allowed several small-scale projects to be renewed in a move that has not assuaged the freeze. Speaking about the international criticism following every such announcement, Netanyahu said Jerusalem is "our capital and as such it is not a settlement, the neighborhoods in which we are living, Jews are living and we've been building, have been there for close to 50 years by successive Israeli governments. Everybody knows that in any peace arrangement they will remain part of Israel." "And equally I think that the bogus claim that this conflict that persists...because of this or that settlement is false because I believe that the issue is not about territory; it's about our existence," added Netanyahu. He continued "the Palestinians expect us to recognize that they have a right to a state of their own, yet they say to the Jewish people who have been here for close to 4,000 years, from the time of Abraham: You do not have a right for a state of your own. That's absurd." Netanyahu said the recent moves by the UK, Sweden, and talk in France of following suit in recognizing the PA as the "state of Palestine" are "irresponsible" given the PA refusal to recognize Israel. "Stop ISIS, don't side with Iran"
The prime minister also spoke about the threats facing Israel and the world, warning "if Iran is left with residual capacity to enrich uranium for a nuclear bomb, ultimately this will destabilize the world." Likewise, Netanyahu warned about "the jihadist tide" seen in terrorist groups such as Islamic State (ISIS) running rampant in Syria and Iraq, and Hamas in Gaza. "I think the battle against ISIS should not come at the expense of the efforts to prevent Iran from acquiring nuclear weapons. Both of them should be pursued independently and not linked to one another," said Netanyahu. He added "it's important that neither side in the militant Sunni-Shiite divide gets an advantage, and certainly it's important that none of them, neither side, gets nuclear weapons. That would be a departure in history." The latest reference comes after US President Barack Obama was revealed to have sent a secret letter to Iranian Supreme Leader Ayatollah Khamenei last month, in which he reportedly called for cooperation on ISIS and urged a nuclear deal. Obama reportedly has quietly been raising the "centrifuge ceiling" being offered to Iran, and statements from his administration indicate a desperation to strong-arm through a nuclear deal.